I was excited to get an email from Ariella Zwillinger, a 15-year-old in Maryland, with photos of a piece she made for an art show this month. She says that it took her a couple months to finish, but in the end she is proud of it, and you can see why. For the pens I used Stabilo Point 88 Pen Set. I made each Spirograph with either a spirotot or Spirograph set, and then cut them out individually with an exacto knife.This part was very time consuming because of all the ridges and corners of the designs. Then I separated them by color so I could find a layout that I liked. Once I did this, I glued them on to a thick piece of paper with a regular glue stick. 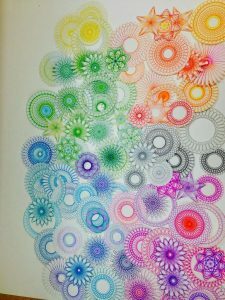 When I had made the Spirographs, I made them on regular sketchbook paper. What my art teacher later told me was that I should have used acid-free paper, so the colors wouldn’t fade or the paper turn yellow. Hopefully that won’t happen any time soon! Here are some more pictures Ariella sent. 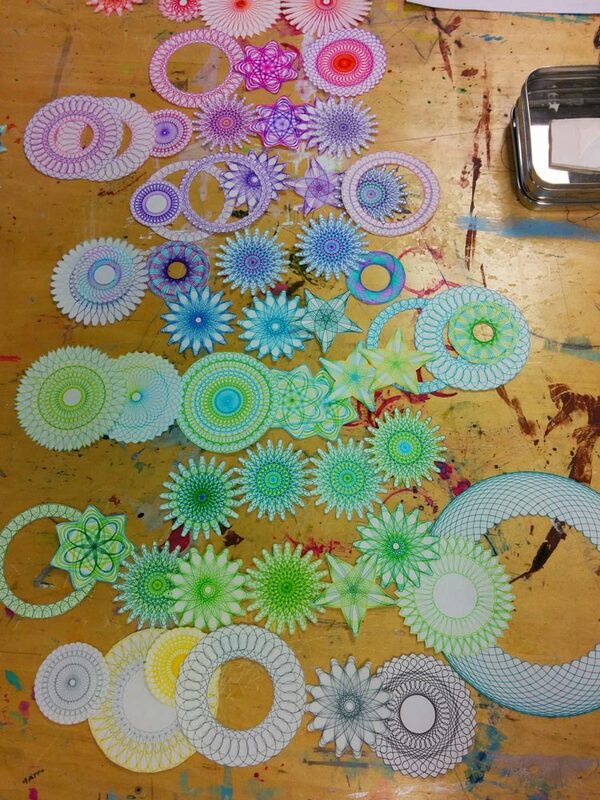 You can see how carefully she cut out each design with the exacto knife. I can only imagine how painstaking a job that was, but it really works in the finished collage, which is luminous. 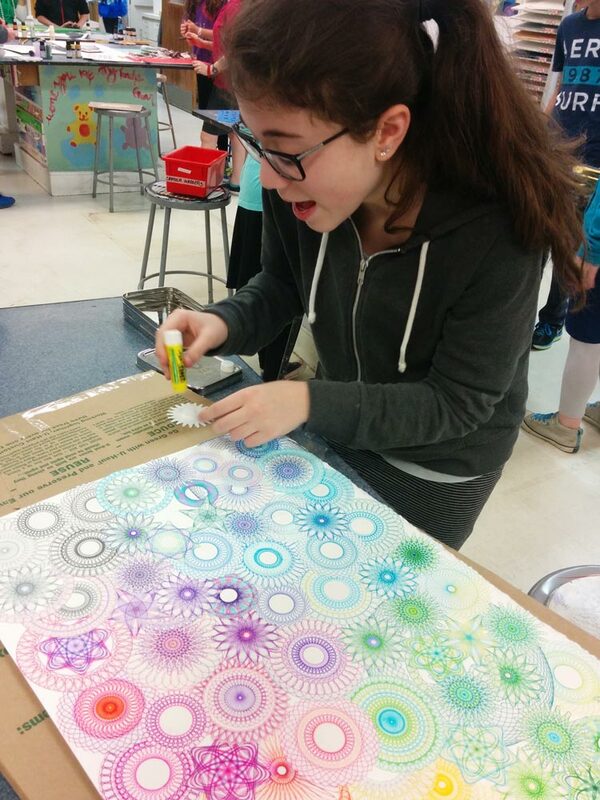 Great job, Ariella, and thanks so much for sending your story and photos! wow, what a fantastic piece of artwork! And what a great job in cutting and combining all the circles. Thank you so much, I’m glad all of that hard work paid off! Is there a way to post this on Facebook?? I see that the sharing buttons had got turned off – sorry! They should show up on the left now. You can also (anytime, for any web page) copy the address in the address bar and paste it into your status update. This is amazing! Great job, Ariella, you’re an artist! Wow! It’s stunning! Can’t wait to see her next piece of work. Do you know if she blogs? I don’t think so, but we can encourage her, can’t we?! wow! this is not kiddie stuff. it is more like sculpture. it should be recognized accordingly. it is a museum quality. 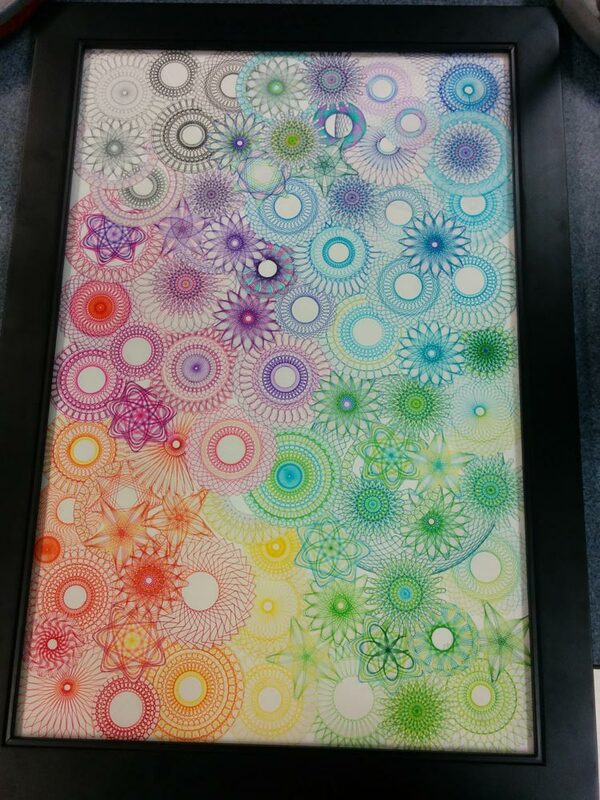 my children had the old style spirograph. much time putting this piece of ART! she seems to be too modest . think the effort was a swish of the tool and out came this fabulous ARTWORK. only an ARTIST or G-D can come up with this art!! I am so impressed. Do you remember how you did all these various patterns? Would you be willing to share instructions? I think your patterns are just marvelous. Hi, thanks so much! All of the spirographs that I did were just from the booklet that comes with the set, and I just messed around with the colors. The other ones were from a spirotot, which is meant for kids origninally, but I think it’s so fun and interesting seeing how the patterns fit together and the effects they make. Don’t be limited by what the booklets give you. Just grab a ring and any wheel and see what you get. Then run with it. Do a different hole in a different color, but line it up with the first pattern, for example. I guess I should make a blog post about improvising in Spirograph. It’s kind of like playing jazz… or playing a real game of basketball and not just drills. Ariella, you really encouraged me with your piece of work. Its really awesome. Keep making such artworks and encourage us to learn from you. Thanks heather for running such a wonderful blog. Waiting for your next post. Well done, it’s absolutely gorgeous. Keep up the great work.